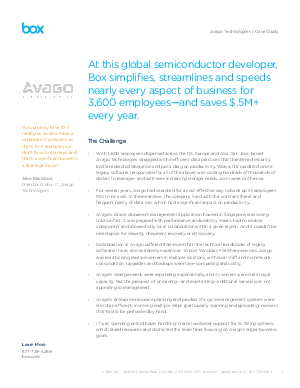 Midsize semiconductor manufacturer saves $0.5MM in infrastructure expenses by switching from servers to Box. They use Box company-wide: R&D, sales, M&A, legal, and more. Technology industry, manufacturing industry, midsize company, midmarket, NA, server replacement, Sales LOB, R&D LOB, M&A, Legal LOB, Box Content API, cost savings.